A worn or damaged hydraulic cylinder can have a negative impact on the efficient operation of your forklift. Cliff Industrial specializes in forklift cylinder rebuilding and replacements. Rebuilding a forklift’s hydraulic cylinder can save you the cost of buying a new one. We disassemble the cylinder and perform a thorough inspection. We’ll clean and replace any damaged or worn seals, rods, heads, barrels or pistons before reassembling the cylinder and returning it to you in factory new condition. If the cylinder has sustained too much damage, we can install a new one. Cliff Industrial offers professional fork truck and forklift maintenance and repair services for all types of fork truck and forklifts, including gas, electric, LPG and diesel vehicles. Cylinder repair is one of our specialties. See our complete hydraulic cylinder repair services. Our factory trained, certified mechanics have experience performing repair and maintenance for all the major forklift manufacturers including Nissan, Toyota, Yale-Hyster, Crown, Komatsu and Raymond. Forklifts, lift trucks and similar vehicles play an important role in the day to day operations of many companies. 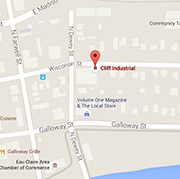 If your forklifts or lift trucks are in need of expert repair give Cliff Industrial a call, 715-835-8314. We deliver the experience you’re looking for and the service you require at a price you can afford. No job is too difficult for us to handle. Contact us today to learn more about our forklift and lift truck repair services.